← Final Days of the Library Butterflies – Come add one! Next month’s book is here! 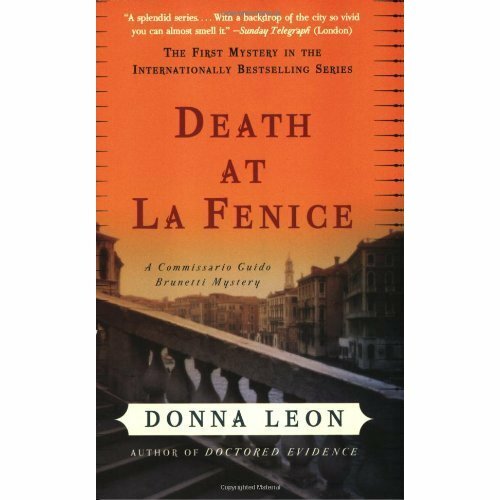 Death at La Fenice is the first novel by American Donna Leon, an ex-pat living in Venice, Italy, and the first of the internationally bestselling Commissario Brunetti mystery series. Come by to pick up a copy and join the discussion in June! Beautiful and serene Venice is a city almost devoid of crime. But that is little comfort to Maestro Helmut Wellauer, a world-renowned conductor whose intermission refreshment comes one night with a little something extra in it: cyanide. For Guido Brunetti, vice-commissario of police and detective genius, finding a suspect isn’t a problem; narrowing the large and unconventional group of enemies down to one is. As the suave and pithy Brunetti pieces together clues, a shocking picture of depravity and revenge emerges, leaving him torn between what is and what should be right–and questioning what the law can do, and what needs to be done.